Bismillaahir-Rahmaanir-Raheem. Qul 'a'oothu birabbil-falaq. Min sharri maa khalaq. Wa min sharri ghaasiqin 'ithaa waqab. Wa min sharrin-naffaathaati fil-'uqad. Wa min sharri haasidin 'ithaa hasad. With the Name of Allah, the Most Gracious, the Most Merciful. Say: I seek refuge with (Allah) the Lord of the daybreak, from the evil of what He has created, and from the evil of the darkening (night) as it comes with its darkness, and from the evil of those who practice witchcraft when they blow in the knots, and from the evil of the envier when he envies. Bismillaahir-Rahmaanir-Raheem. Qul 'a'oothu birabbin-naas . Malikin-naas . 'Ilaahin-naas . Min sharril-waswaasil-khannaas . Allathee yuwaswisu fee sudoorin-naas . Minal-jinnati wannaas . 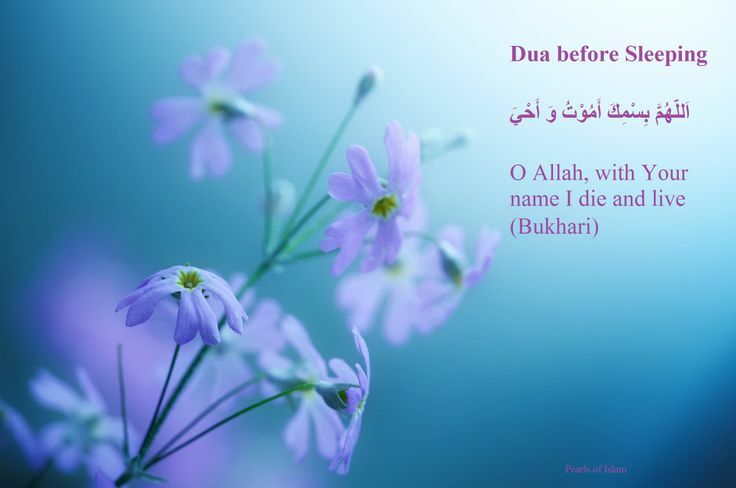 With the Name of Allah , the Most Gracious , the Most Merciful. Say: I seek refuge with (Allah) the Lord of mankind, the King of mankind , the God of mankind , from the evil of the whisperer who withdraws , who whispers in the breasts of mankind, of jinns and men . Reference: Al-Bukhari, cf. Al-Asqalani, Fathul-Bari 9/62, and Muslim 4/ 1723. "اللهُ لَا إِلَهَ إِلَّا هُوَ الْحَيُّ الْقَيُّومُ لَا تَأْخُذُهُ سِنَةٌ وَلَا نَوْمٌ لَهُ مَا فِي السَّمَاوَاتِ وَمَا فِي الْأَرْضِ مَنْ ذَا الَّذِي يَشْفَعُ عِنْدَهُ إِلَّا بِإِذْنِهِ يَعْلَمُ مَا بَيْنَ أَيْدِيهِمْ وَمَا خَلْفَهُمْ وَلَا يُحِيطُونَ بِشَيْءٍ مِنْ عِلْمِهِ إِلَّا بِمَا شَاءَ وَسِعَ كُرْسِيُّهُ السَّمَاوَاتِ وَالْأَرْضَ وَلَا يَئُودُهُ حِفْظُهُمَا وَهُوَ الْعَلِيُّ الْعَظِيمُ". Allah! There is no God but He, the Ever Living, the One Who sustains and protects all that exists. Neither slumber nor sleep overtakes Him. To Him belongs whatever is in the heavens and whatever is on the earth. Who is he that can intercede with Him except with His Permission? He knows what happens to them in this world, and what will happen to them in the Hereafter. And they will never encompass anything of His Knowledge except that which He wills. His Throne extends over the heavens and the earth, and He feels no fatigue in guarding and preserving them. And He is the Most High, the Most Great. Reference: Al-Baqarah 2:255. Whoever reads this when he lies down to sleep will have a guardian from Allah remain with him and Satan will not be able to come near him until he rises in the morning. See Al-Bukhari, cf. Al-Asqalani, Fathul-Bari 4/487. "آمَنَ الرَّسُولُ بِمَا أُنْزِلَ إِلَيْهِ مِنْ رَبِّهِ وَالْمُؤْمِنُونَ كُلٌّ آمَنَ بِاللهِ وَمَلَائِكَتِهِ وَكُتُبِهِ وَرُسُلِهِ لَا نُفَرِّقُ بَيْنَ أَحَدٍ مِنْ رُسُلِهِ وَقَالُوا سَمِعْنَا وَأَطَعْنَا غُفْرَانَكَ رَبَّنَا وَإِلَيْكَ الْمَصِيرُ ۞ لَا يُكَلِّفُ اللهُ نَفْسًا إِلَّا وُسْعَهَا لَهَا مَا كَسَبَتْ وَعَلَيْهَا مَا اكْتَسَبَتْ رَبَّنَا لَا تُؤَاخِذْنَا إِنْ نَسِينَا أَوْ أَخْطَأْنَا رَبَّنَا وَلَا تَحْمِلْ عَلَيْنَا إِصْرًا كَمَا حَمَلْتَهُ عَلَى الَّذِينَ مِنْ قَبْلِنَا رَبَّنَا وَلَا تُحَمِّلْنَا مَا لَا طَاقَةَ لَنَا بِهِ وَاعْفُ عَنَّا وَاغْفِرْ لَنَا وَارْحَمْنَا أَنْتَ مَوْلَانَا فَانْصُرْنَا عَلَى الْقَوْمِ الْكَافِرِينَ"
'Aamanar-Rasoolu bimaa 'unzila mir-Rabbihi walmu'minoon, kullun 'aamana billaahi wa malaa'ikatihi wa Kutubihi wa Rusulihi, laa nufarriqu bayna 'ahadim-mir-Rusulihi, wa qaaloo sami'naa wa 'ata'naa ghufraanaka Rabbanaa wa 'ilaykal-maseer. Laa yukallifullaahu nafsan 'illaa wus'ahaa, lahaa maa kasabat wa 'alayhaa mak-tasabat, Rabbanaa laa tu'aakhithnaa 'in naseenaa 'aw 'akhta'naa, Rabbanaa wa laa tahmil 'alaynaa 'isran kamaa hamaltahu 'alal-latheena min qablinaa, Rabbanaa wa laa tuhammilnaa maa laa taaqata lanaa bihi, wa'fu 'annaa, waghfir lanaa warhamnaa, 'Anta Mawlaanaa fansurnaa 'alal-qawmil-kaafireen. The Messenger believes in what has been send down to him from his Lord, and so do the believers. Each one believes in Allah, His Angels, His Books, and His Messengers. They say: "We make no distinction between any of His Messengers," and they say: "We hear, and we obey. (We seek) Your Forgiveness, our Lord, and to You is the return." Allah burdens not a person beyond what he can bear. He gets reward for that (good) which he has earned, and he is punished for that (evil) which he has earned. Our Lord! Punish us not if we forget or fall into error. Our Lord! Lay not on us a burden like that which You did lay on those before us. Our Lord! Put not on us a burden greater than we have strength to bear. Pardon us and grant us forgiveness. Have mercy on us. You are our Protector, and help us against the disbelieving people. Reference: Al-Baqarah 2:285-6. These two Verses will be sufficient for anyone who recites them at night before sleeping. Al-Bukhari, cf. Al-Asqalani, Fathul-Bari.9/94, Muslim 1/554. بِاسْمِكَ رَبِّي وَضَعْتُ جَنْبِي، وَبِكَ أَرْفَعُهُ، فَإِنْ أَمْسَكْتَ نَفْسِي فَارْحَمْهَا، وَإِنْ أَرْسَلْتَهَا فَاحْفَظْهَا، بِمَا تَحْفَظُ بِهِ عِبَادَكَ الصَّالِحِينَ". Bismika Rabbee wadha'tu janbee , wa bika 'arfa'uhu, fa'in 'amsakta nafsee farhamhaa, wa 'in 'arsaltahaa fahfadhhaa, bimaa tahfadhu bihi 'ibaadakas-saaliheen. 1 "If any of you rises from his bed and later returns to it, let him dust off his bed with his waist garment three times and mention the Name of Allah, for he does not know what may have entered the bed after him, and when he lies down he should say. . . ". 2 Al-Bukhari 1 1/ 126 and Muslim 4/2084. "اللَّهُمَّ إِنَّكَ خَلَقْتَ نَفْسِي وَأَنْتَ تَوَفَّاهَا، لَكَ مَمَاتُهَا وَمَحْيَاهَا، إِنْ أَحْيَيْتَهَا فَاحْفَظْهَا، وَإِنْ أَمَتَّهَا فََاغْفِرْ لَهَا، اللَّهُمَّ إِنِّي أَسْأَلُكَ الْعَافِيَةَ". Allaahwmma 'innaka khalaqta nafsee wa 'Anta tawaffaahaa, laka mamaatuhaa wa mahyaahaa, 'in 'ahyaytahaa fahfadhhaa, wa 'in 'amattahaa faghfir lahaa . Allaahumma 'innee 'as'alukal-'aafiyata. O Allah, You have created my soul and You take it back. Unto You is its death and its life . If You give it life then protect it , and if You cause it to die then forgive it. O Allah, I ask You for strength. Reference: Muslim 4/2083 and Ahmad 2/79. "اللَّهُمَّ قِنِي عَذَابَكَ يَوْمَ تَبْعَثُ عِبَادَكَ". Allaahumma qinee 'athaabaka yawma tab'athu 'ibaadaka. 1 "When the Prophet (SAW) wanted to lie down to sleep, he used to place his right hand under his cheek and say..."
2 Abu Dawud 4/311. See also Al-Albani, Sahih At-Tirmithi 3/143. Bismika Allaahumma 'amootu wa 'ahyaa. 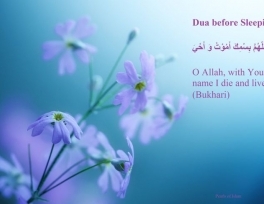 In Your Name , O Allah , I die and I live. Reference: Here, dying and living are metaphors for sleep and wakefulness. This explains why the normal order of these words has been reversed in this Hadith. In other contexts the living is mentioned before dying. See Qur'an Al-Baqarah 2:258, Aal-'Imran 3:156, Al-A'raf 7:158 among many other examples, (trans.). See also Al-Asqalani, Fathul-Bari 11/113, Muslim 4/ 2083. "سُبْحَانَ اللهِ، والْحَمْدُ للهِ، وَاللهُ أَكْبَرُ". 106: Subhaanallaahi, - Walhamdu lillaahi, -Wallaahu 'Akbar. Reference: Al-Bukhari, cf. Al-Asqalani, Fathul-Bari 7/71, Muslim 4/2091. "اللَّهُمَّ رَبَّ السَّمَاوَاتِ السَّبْعِ وَرَبَّ الْعَرْشِ الْعَظِيمِ، رَبَّنَا وَرَبَّ كُلِّ شَيْءٍ، فَالِقَ الْحَبِّ وَالنَّوَى، وَمُنْزِلَ التَّوْرَاةِ وَالْإِنجِيلِ، وَالْفُرْقَانِ، أَعُوذُ بِكَ مِنْ شَرِّ كُلِّ شَيْءٍ أّنْتَ آخِذٌ بِنَاصِيَتهِ. اللَّهُمَّ أَنْتَ الأَوَّلُ فَلَيْسَ قَبْلَكَ شَيْءٌ، وَأَنْتَ الْآخِرُ فَلَيْسَ بَعْدَكَ شَيْءٌ، وَأَنْتَ الظَّاهِرُ فَلَيْسَ فَوْقَكَ شَيْءٌ، وَأَنْتَ الْبَاطِنُ فَلَيْسَ دُونَكَ شَيْءٌ، اقْضِ عَنَّا الدَّيْنَ وَأَغْنِنَا مِنَ الْفَقْرِ". Allaahumma Rabbas-samaawaatis-sab'i wa Rabbal-'Arshil-'Adheem, Rabbanaa wa Rabba kulli shay 'in, faaliqal-habbi wannawaa , wa munzilat-Tawraati wal-'Injeeli, wal-Furqaani, 'a'oothu bika min sharri kulli shay 'in 'Anta 'aakhithun binaasiyatihi. Allaahumma 'Antal-'Awwalu falaysa qablaka shay'un, wa 'Antal-'Aakhiru falaysa ba'daka shay'un, wa 'Antadh-Dhaahiru falaysa fawqaka shay'un, wa 'Antal-Baatinu falaysa doonaka shay'un, iqdhi 'annad-dayna wa 'aghninaa minal-faqri. 1The Scripture that was revealed to 'Isa (Jesus). "الْحَمْدُ للهِ الَّذِي أَطْعَمَنَا وَسَقَانَا، وَكَفَانَا، وَآوَانَا، فَكَمْ مِمَّنْ لَا كَافِيَ لَهُ وَلَا مُؤْويَ". 108: Alhamdu lillaahil-lathee 'at'amanaa wa saqaanaa, wa kafaanaa, wa 'aawaanaa, fakam mimman laa kaafiya lahu wa laa mu'wiya. Praise is to Allah Who has provided us with food and with drink , sufficed us and gave us an abode for how many are there with no provision and no home. "اللَّهُمَّ عَالِمَ الْغَيْبِ وَالشَّهَادَةِ فَاطِرَ السَّمَاواتِ والْأَرْضَ، رَبَّ كُلِّ شَيْءٍ وَمَلِكُهُ، أَشْهَدُ أَنْ لَا إِلَهَ إِلَّا أَنْتَ، أَعُوذُ بِكَ مِنْ شَرِّ نَفْسِي، وَمِنْ شَرِّ الشَّيْطَانِ وَشِرْكِهِ، وَأَنْ أَقْتَرِفَ عَلَى نَفْسِي سُوءاً، أَوْ أَجُرَّهُ إِلَى مُسْلِمٍ". 109: Allaahumma 'Aalimal-ghaybi wash-shahaadati faatiras-samaawaati wal'ardhi, Rabba kulli shay 'in wa maleekahu, 'ash-hadu 'an laa 'ilaaha 'illaa 'Anta, 'a'oothu bika min sharri nafsee, wa min sharrish-shaytaani wa shirkihi, wa 'an 'aqtarifa 'alaa nafsee soo 'an, 'aw 'ajurrahu 'ilaa Muslimin. O Allah, Knower of the unseen and the evident , Maker of the heavens and the earth , Lord of everything and its Master, I bear witness that there is none worthy of worship but You . I seek refuge in You from the evil of my soul and from the evil of Satan and his helpers . (I seek refuge in You) from bringing evil upon my soul and from harming any Muslim. Reference: Abu Dawud 4/317. See also Al-Albani, SahihAt-Tirmithi 3/142. "المٓ ۞ تَنْزِيلُ الْكِتَابِ" وَ "تَبَارَكَ الَّذِي بِيَدِهِ الْمُلْكُ". 110: Recite Surah 32 (As-Sajdah) and Surah 67 (Al-Mulk) in Arabic. "اللَّهُمَّ أَسْلَمْتُ نَفْسِي إِلَيْكَ، وَفَوَّضْتُ أَمْرِي إِلَيْكَ، وَوَجَّهْتُ وَجْهِي إِلَيْكَ، وَأَلْجَأْتُ ظَهْرِي إِلَيْكَ، رَغْبَةً وَرَهْبَةً إِلَيْكَ، لَا مَلْجَأَ وَلّا مَنْجَا مِنْكَ إِلَّا إِلَيْكَ، آمَنْتُ بِكِتَابِكَ الَّذِيْأَنْزَلْتَ وَبِنَبِيِّكَ الَّذِي أَرْسَلْتَ". 111: Allaahumma 'aslamtu nafsee 'ilayka, wa fawwadhtu 'amree 'ilayka, wa wajjahtu wajhee 'ilayka, wa 'alja'tu dhahree 'ilayka, raghbatan wa rahbatan 'ilayka, laa raalja' wa laa manja minka 'illaa 'ilayka, 'aamantu bikitaabikal-lathee 'anzalta wa bi-nabiyyikal-lathee 'arsalta. O Allah, I submit myself to You, entrust my affairs to You, turn my face to You, and lay myself down depending upon You , hoping in You and fearing You . There is no refuge , and no escape, except to You. I believe in Your Book (the Qur'an) that You revealed, and the Prophet whom You sent.